Happy May Day! My favorite month of the year has arrived. 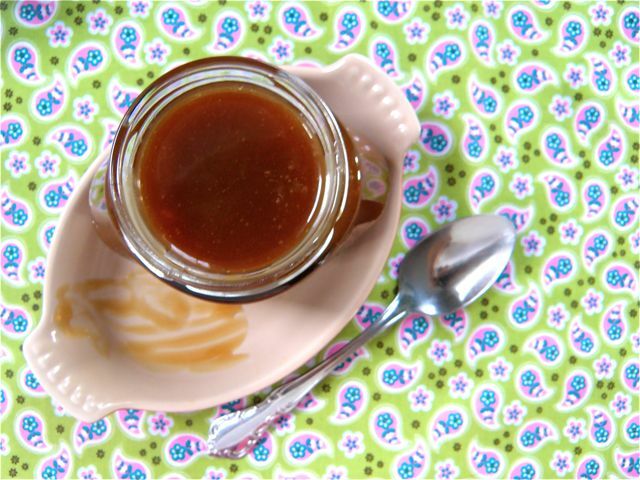 To celebrate May, and my one-month blogiversary, I decided to make this delicious salted caramel sauce adapted from Two Peas and their Pod. Now that I have two jars full of this stuff, I can make these salted caramel skillet brownies and my life will be complete. I used coconut milk in my version because I had some and wanted to see if it would work–it did! You will not taste the coconut at all. I have a theory that the sauce is slightly healthier with this modification (if you gloss over the huge amounts of sugar and butter). I also added vanilla, which gives the sauce greater depth. Get all your ingredients ready so you won’t have to scramble while you’re making the caramel–it burns really easily! Heat the sugar in a saucepan over medium-high heat. When the sugar starts melting, whisk it until fully melted. Then, swirl the saucepan around until the sugar turns a deep amber color or measures 350 on a candy thermometer. My caramel was a pretty deep color by the time all the sugar melted, so I just stopped right there. I don’t have a candy thermometer and really didn’t want to burn it. Good news–it turned out great : ). Add the butter and whisk until fully melted. Off the heat, add the coconut milk or cream, salt, and vanilla and stir until smooth. If your caramel is stubborn, reheat over medium heat, stirring constantly, just until it smooths out. Let the caramel cool for about ten minutes in the pot, then pour into jars and cool to room temperature. Stored in the refrigerator, this sauce keeps for about a month. However, I don’t think mine is going to last that long. Any other ideas about how to use this fabulous sauce? I’m tempted to put it in or on everything, from my morning coffee to pizza. Someone stop me! 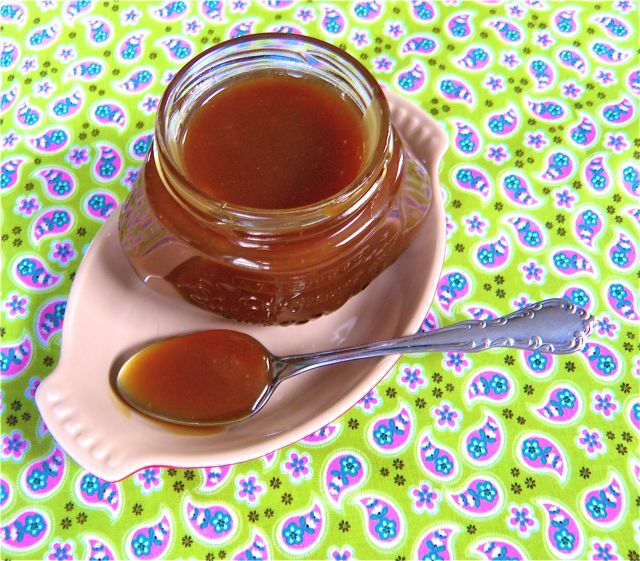 This is the best recipe I have tried for Salted Caramel Sauce. It's a favorite in our house. So glad you like it, Amber! Made it without a thermometer and it was still wonderful. I filled some dark chocolate cupcakes with it and then had to stop myself from eating the rest with a spoon. Thanks, Jan! I'm so glad you liked it. It's definitely not low in calories, but it's perfect for special occasions :). Update–I just put this in my morning coffee, and it was fabulous. Almost a macchiato! It looks so good! Does it taste salty?